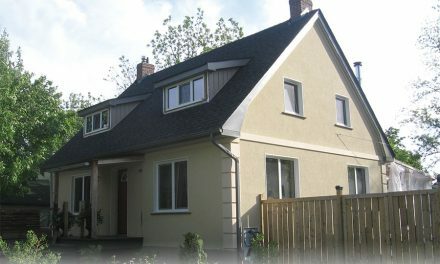 Feb 9, 2011 | Energy Efficiency, Featured Stories, Why ICFs? 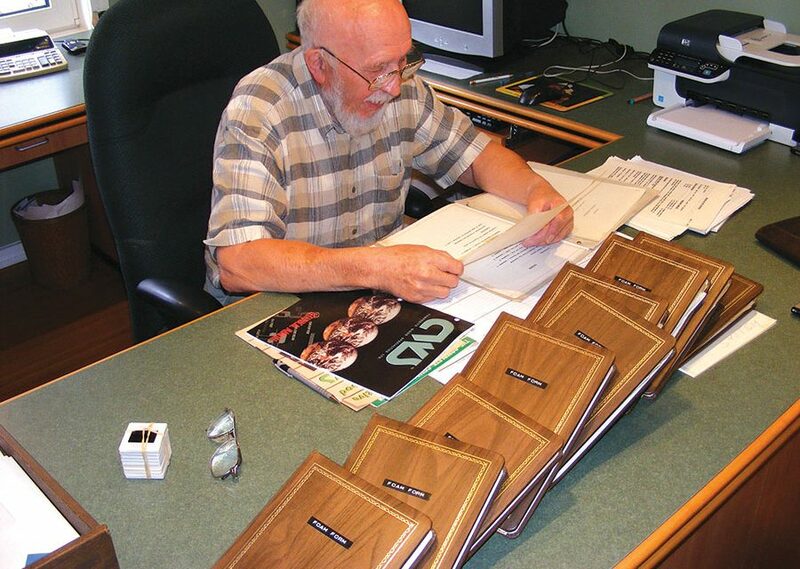 Werner Gregori, inventor of the insulated concrete form, at his desk, reviewing a few of the dozens of photo albums and scrapbooks he’s compiled documenting the infancy and early growth of an industry. 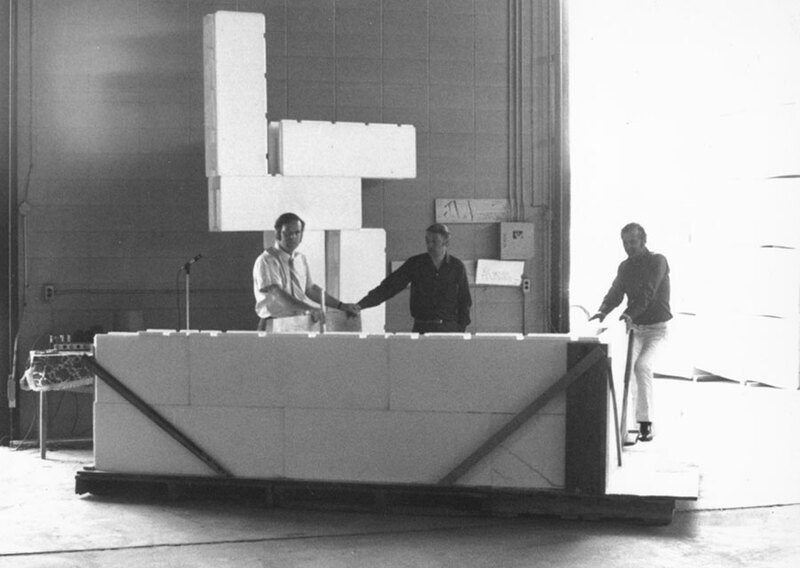 In 1967 Werner Gregori patented the first ICF in North America. 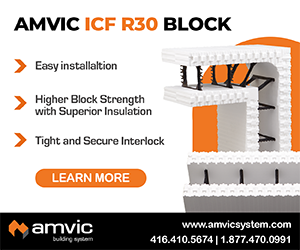 In the fall of 2010, Mr. Gregori invited me to his home in Southern Ontario, where we spent a pleasant afternoon talking about his pioneering efforts that launched an industry, and what the past 40 years of ICF construction can tell us about the future. Dozens of scrapbooks and photo albums from the era provided the data necessary to verify key dates and events. They also contained the never-before-published photos seen on the following pages. C R: Tell me about how you discovered the idea behind ICFs. WG: Back then, [in the mid-1960s] I was working as a general contractor, building apartments [in Southern Ontario]. In the summer of 1965, I was vacationing up north at Algonquian Park. We had one of those foam plastic coolers to keep the drink cold. 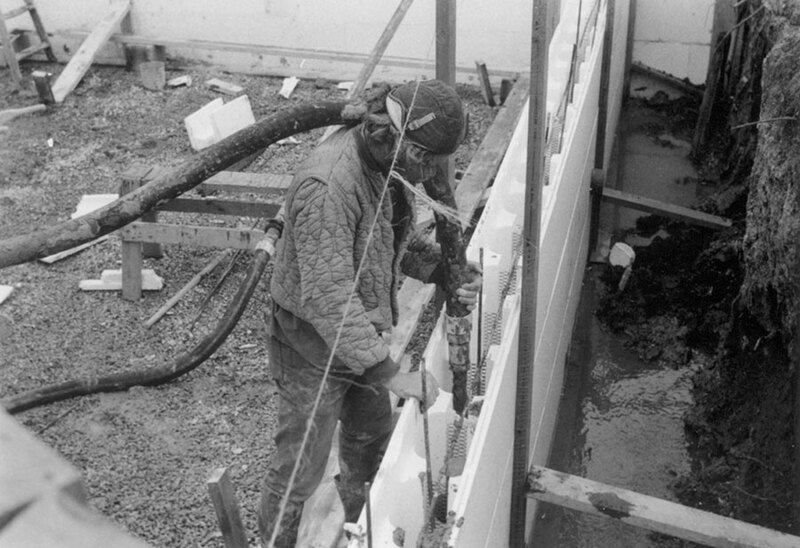 When I saw kids on the beach playing with the sand, I realized that if concrete blocks could be formed using that foam plastic, many construction costs and hours of labor could be eliminated.” Within a year, he had converted his foam cooler epiphany into the first ICF. Called “Foam Form,” each block measured 16 inches high by 48 inches long with a tongue-and-groove interlock, metal ties, and a waffle-grid core. The design remained virtually unchanged for the next 15 years. The patent was officially submitted in Canada on March 22, 1966, and the U.S. patent application granted October 24, 1968. CR: So all of the ICFs in existence came from this idea in your head? WG: Yes, I went back to Germany shortly after I received my patents to meet with BASF [the major German-based chemical company that invented EPS.] I showed them my ideas, and they developed them further. But it is not true that I got the idea from Germany. Germany got the idea from me. CR: Did you have any idea about the size of the market? WG: When I started to experiment with foam products and develop the design, I was convinced it would be too expensive for use in houses. But by the time I had a product ready for market, skilled labor rates and the price of lumber had risen to a point where the system was very competitive. [The price of framing lumber doubled in 1969.] Also, I knew that BASF’s patent for the EPS bead was nearing its end, which would cut the price of my raw materials by half. Before the widespread use of pump trucks, forms were filled using wheelbarrows, grout pumps (top) and crane buckets (bottom). CR: What were the biggest challenges you faced getting Foam Form to market? WG: The biggest challenge we faced was just getting the product accepted as a legitimate alternative. It was primarily contractor resistance. They just didn’t want to change the way they were used to building. What finally won them over was the ease of installation. We also had problems getting the product accepted…. by insurance companies and in the fire codes. CR: How did you overcome those obstacles? CR: Tell me about the first ICF structure built in North America. 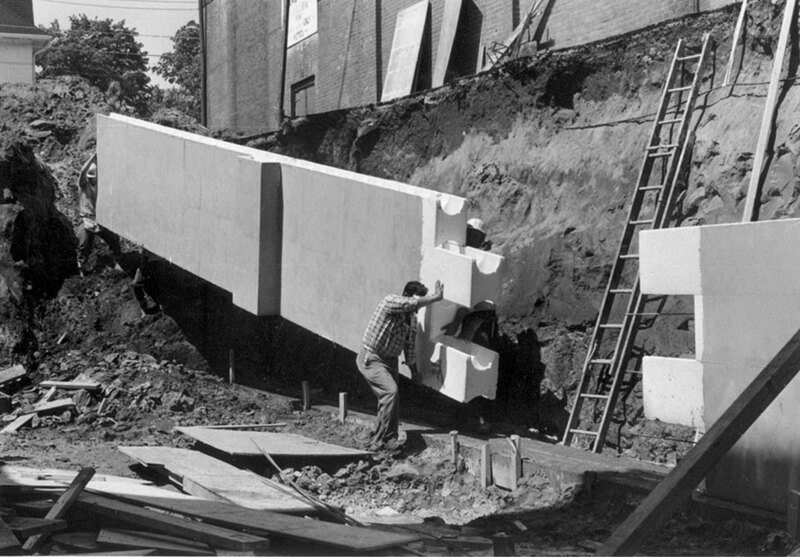 WG: The first project Foam Form was involved with was a home on Lakeshore Drive, [in Oakville, Ontario]. But I don’t know if that was truly the first in North America; there was another company doing something down in Arkansas with foam during the LBJ Era [1963-1968], and Dow Chemical had a project in Sheboygan [Wisconsin] about that time, too. Working with a molder in Kitchener, Ontario, Gregory wasted no time getting to work on an actual project. Patrick “Bud” Kelly, owner of Allied Construction, completely reworked plans for a home he was building in Oakville, Ontario on Lakeshore Dr. near the intersection with Chartwell Dr. Completed in the spring of 1969. The home attracted extensive publicity, from both professional media and interested onlookers. News reports indicate police had to be called on several occasions to help speed traffic past the home. Bud Kelly was so impressed that he became a shareholder in the company and developed the first installer pricing estimates. 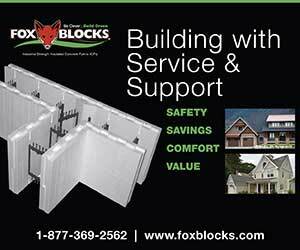 ICFs received extensive publicity in the construction press and by the mainstream Toronto news organizations. 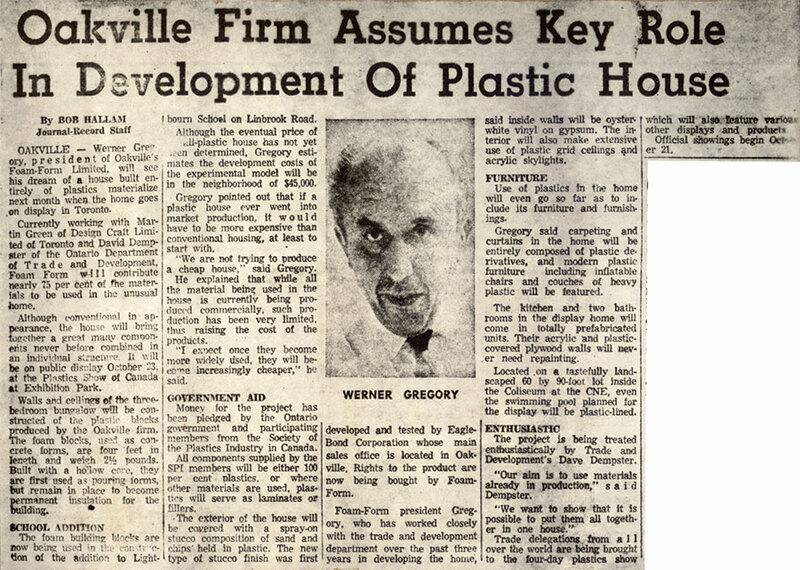 The home was successful enough that Gregory was asked to provide forms to build a house on the floor of the exhibit hall for the 1969 Plastics Show of Canada. 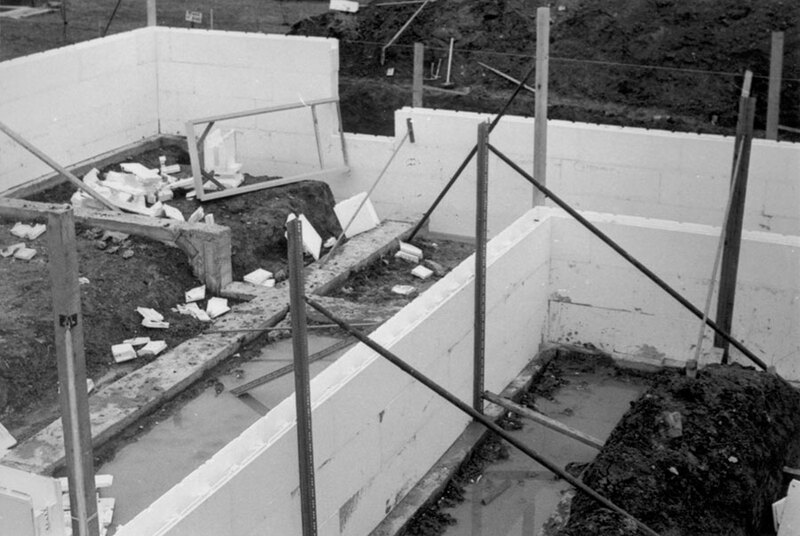 Filling the forms with sand instead of concrete, the 3-bedroom house was a show-stopper. Inquires poured in from across the continent. By December of 1969, Gregori was molding locally in Kitchener and Ajax, on both coasts (Montreal and Vancouver) and had set up licensees in Miami, Fla.; San Juan, Puerto Rico; Japan, and Germany. 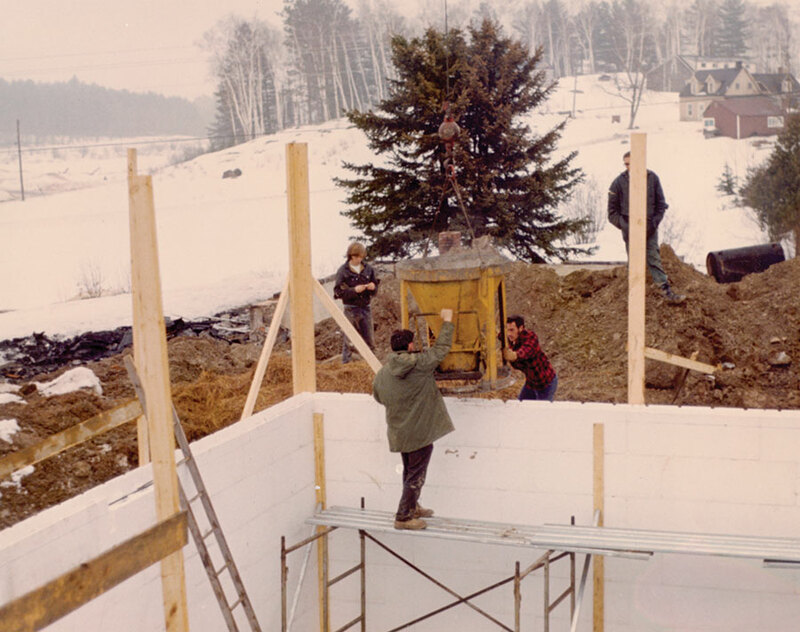 ICF contractors have been innovative from the beginning, experimenting with panelization in the spring of 1970 (above), and turnbuckle bracing as early as 1972 (below left). Having young women promote ICF’s light weight was an early marketing ploy (below right). She is standing in front of what may be the first ICF home ever built, in May 1969. CR: How early was the company involved with commercial construction? WG: I always believed that the real economy of the system would come in high-rise housing. In ’69 we built townhouses in Leamington [consisting of 12 two-story units], Clarkston, and Mississauga. 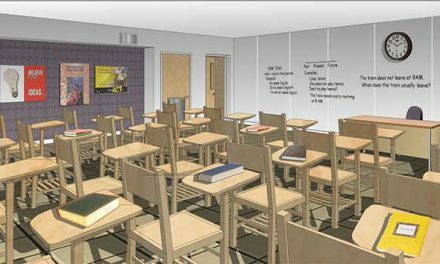 Sometime around there, we were also involved in doing that big addition on Lightbourn School. St. Mildred’s Lightbourn School is a private Christian school located on Linbrook Rd. in Toronto. The addition, consisting of seven classrooms, an auditorium and gymnasium, cost C$400,000 in 1969, equivalent to $2.5 million today. 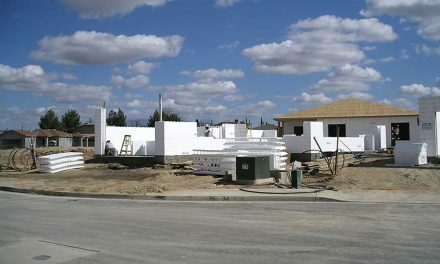 All exterior walls were built using the Foam Form system, which were installed by Ivey Dreger Construction. The addition is still in use today. CR: What was the biggest project you were involved with in those early years? WG: The James Bay project in Quebec was huge. Thousands of men needed housing in the most remote areas of Quebec. We had projects all over that area, in Matagami, Rouyn, Three Rivers and Quebec City. 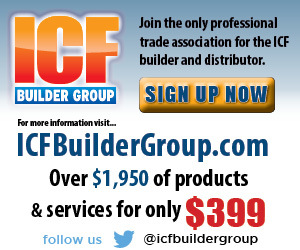 CR: When did you get out of the ICF industry? WG: I sold 50 percent of the company to Universal Sections Ltd. in June of 1969. They had the resources to manage all the growth. 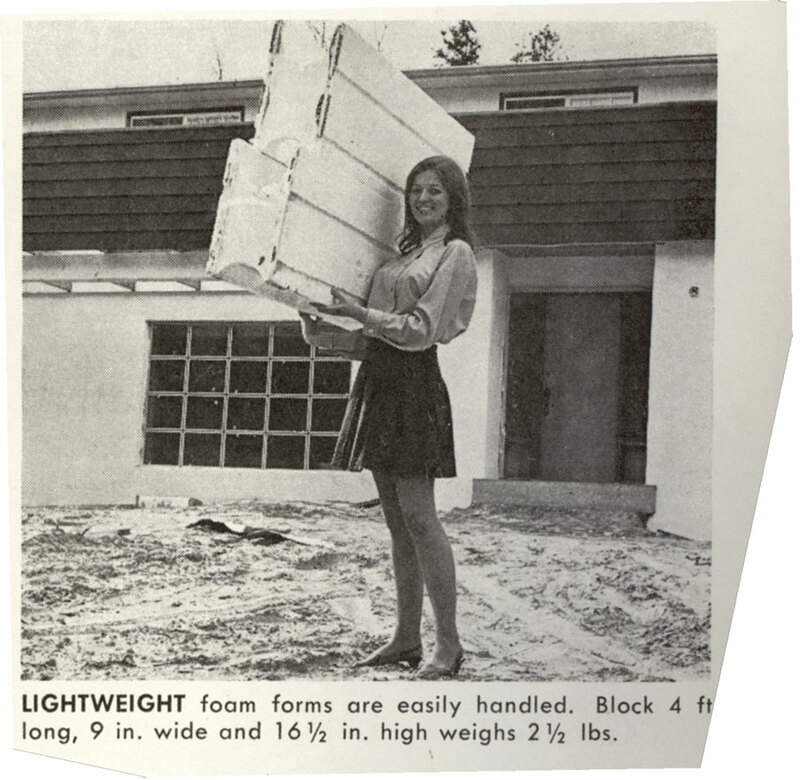 I sold my remaining interest in Foam Form to Universal Plastics in 1971. I stayed on as a consultant for a few months after that. CR: What have you been involved with since then? WG: I consider myself primarily an inventor. I hold 27 patents, most of which deal with foam plastics, composite panels, sandwich systems, and so forth. I spent the last few years developing a plastic composite material suitable for decking, developing ways to reinforce this material with a steel grid so it’s suitable for use in large panels. CR: What does the future hold for ICFs? WG: The U.S. and Canada need a performance-based building code. Otherwise our product will always be at a disadvantage, always pushed aside. Until that happens, though, the industry needs to consolidate and standardize the product. There are too many different companies out there, each explaining why they’re better than the others. This only confuses the customer. The end customer will drive demand, but only if the confusion is taken out of the market… Manufacturers should not see each other as competition, but should bring out a generic product and work to get the price down. The distribution chain is too long, and it makes the price too high. Shorten the distribution chain, standardize the product, and the consumer will create enough demand to keep everyone busy. 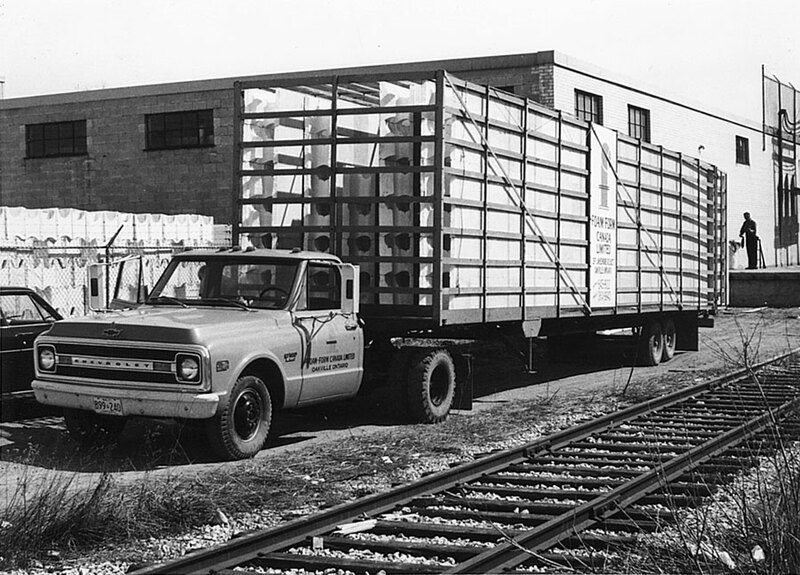 Some aspects of the business are remarkably unchanged after 40 years, as these photos from 1970 attest, including trade show promotion and transportation.